Author(s): Livia Carvalho Ferreira, Ali S. Arbab, Bruna Victorasso Jardim-Perassi, Thaiz Ferraz Borin, Nadimpalli RS Varma, ASM Iskander, Adarsh Shankar, Meser M. Ali, Debora Aparecida Pires de Campos Zuccari. Laboratorio de Investigacao Molecular no Cancer (LIMC), Faculdade de Medicina de Sao Jose do Rio Preto (FAMERP), Avenida Brigadeiro Faria Lima, 5416, Vila Sao Pedro, CEP 15090-000, Sao Jose do Rio Preto, SP, Brasil. The formation of a new blood vessel is stimulated by angiogenic factors. Curcumin, which is the active ingredient of the spice plant Curcuma longa L and is used as food and traditional medicine, has shown anticancer effects against different types of cancers. We evaluated the effects of curcumin on angiogenesis/pro-angiogenic factors in a mouse model of human breast cancer. Cell viability was measured by the MTT assay after curcumin treatment in triple-negative breast cancer cells (MDA-MB-231). For the in vivo study, human breast cancer was induced in athymic mice and treated with 300 mg/kg/day of curcumin administered intraperitoneally. Tumor size was measured weekly, and the animals underwent single photon emission computed tomography (SPECT) scanning with Tc-99m tagged VEGF-c to detect the in vivo expression of VEGFR2/3. In addition, the expression of proangiogenic/ growth factors in the tumor extracts was evaluated by a membrane antibody array. Histological analysis was performed to confirm the effect of curcumin on neovascularization. The MTT assay showed that curcumin significantly reduced the cell viability of MDA-MB-231 cells. In breast cancer xenografts, curcumin treatment led to a decrease in tumor volume and cell proliferation (Ki-67) compared with the vehicle treated group. Tc-99m-HYNIC-VEGF-c-SPECT imaging showed decreased uptake to the tumor, which may indicate a lower expression of VEGFR2/3 in curcumin treated tumors; however, a statistically significant difference was not achieved (p>0.05). Additionally, curcumin treatment showed a significantly low level of expression of pro-angiogenic factors (p<0.05) and a decrease in micro-vessel density (vWF) in animals compared with that of vehicle treated tumors. In conclusion, curcumin treatment showed effectiveness in reducing tumor growth and cell proliferation, as well as in the inhibition of angiogenesis. Keywords: Angiogenesis, breast neoplasm, curcumin, SPECT, xenograft model. Affiliation:Laboratorio de Investigacao Molecular no Cancer (LIMC), Faculdade de Medicina de Sao Jose do Rio Preto (FAMERP), Avenida Brigadeiro Faria Lima, 5416, Vila Sao Pedro, CEP 15090-000, Sao Jose do Rio Preto, SP, Brasil. Keywords:Angiogenesis, breast neoplasm, curcumin, SPECT, xenograft model. Abstract:The formation of a new blood vessel is stimulated by angiogenic factors. Curcumin, which is the active ingredient of the spice plant Curcuma longa L and is used as food and traditional medicine, has shown anticancer effects against different types of cancers. 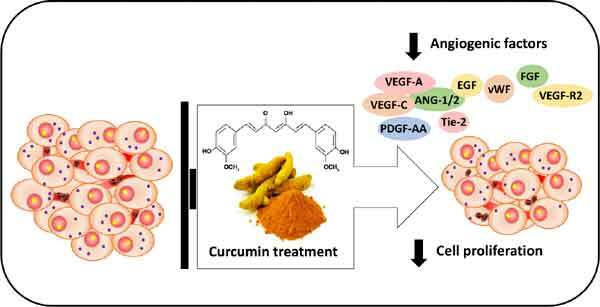 We evaluated the effects of curcumin on angiogenesis/pro-angiogenic factors in a mouse model of human breast cancer.